Ready yourselves, heroes – The Ninth World: A Skillbuilding Game for Numenera premieres at the Lone Shark Games booth at Origins on June 14th before its retail release on June 20th! Based on the Numenera roleplaying game from Monte Cook Games and designed by Paul Peterson, Boyan Radakovich, and Lone Shark’s Mike Selinker, The Ninth World is set a billion years from now in a vast and strange world. Part Eurogame, part RPG, and part deckbuilder, the game contains innovative new gameplay that blends tree advancement, bidding, and deck management. Players can explore the Steadfast solo, competitively, or take on the most dangerous challenges of The Ninth World by combining their powers in cooperatively play. 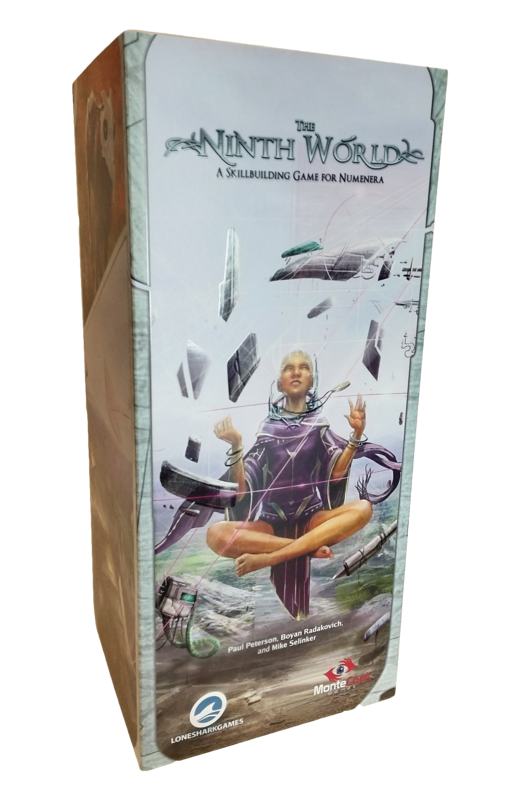 The Ninth World: A Skillbuilding Game for Numenera comes in an elegant box that folds open to become the game board, and contains the following: 12 hero tableaus, 1 valor board, 1 gamebook, 2 dice, 45 region cards, 48 town cards, 60 wilderness cards, 120 skill cards, 50 power cards, 5 bid shields, 1 round marker, 50 hero tokens, 36 quest tokens, and 1 monolith. Gameplay takes about half an hour. You can purchase the game for the MSRP of $49.95. Also available on June 20th is the Ninth World Playmap. On one side is a gorgeous map of the Steadfast, allowing players to track their progression through all the adventures in the base set. On the other is a playmat with spaces for all the card decks. You can post it on your wall or lay it on your table for all your Ninth World games. MSRP for the playmap is $14.95. For those that backed the Ninth World Kickstarter, your products are already shipped or on their way. 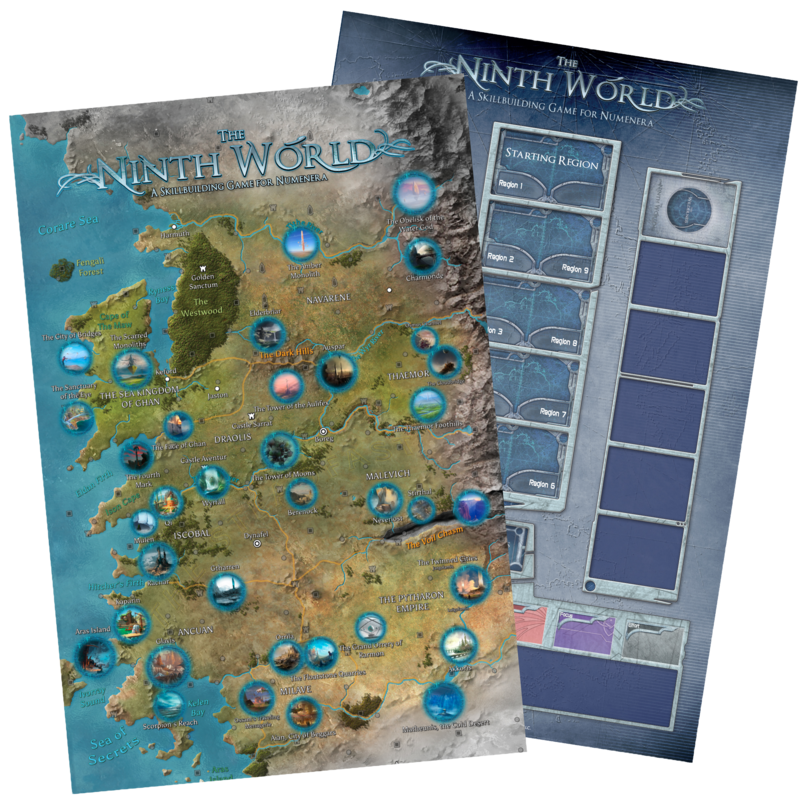 For those who missed out, we’ll have the The Ninth World: A Skillbuilding Game for Numenera and Playmap up in the Monte Cook Games and Lone Shark Games websites soon! Keep an eye out for an upcoming article with news on the Lone Shark Games store and news for Origins!